An instant classic born from London's legendary gunmaker. It had been raining since dawn, alternating between a fine, foggy mist and a let’s-build-an-Ark deluge. It was midafternoon before we got into the big herd, the herd with the stag we wanted. I settled into a prone position, resting on the stalker’s pack, and settled the crosshair about four inches above where I wanted the bullet to strike, allowing a bit of elevation for the 245-yard distance. When the trigger broke, the stag folded where he stood, and my new friend offered sincere congratulations. The “where” was the Scottish Highlands; the “who” was Ronnie Hepburn, game stalker for a considerable portion of the Blair Atholl Estate; and the deer was an eleven-point red stag, replete with double crowns. The rifle was a Rigby Highland Stalker, the latest release from the prestigious firm John Rigby & Co. of London, and taking that red stag in Scotland, with that rifle, was quite an honor. Rigby & Co. is back in London and producing excellent rifles. Their Big Game model is a solid choice for a bolt-action dangerous-game gun, and the Rising Bite double rifle transports you back a century when you hold it. The Highland Stalker continues that reputation. Rigby made its name in the hands of adventurous hunters around the globe, from W.D.M. “Karamoja” Bell and Harry Selby in Africa to Col. Jim Corbett in India and many more. However, the traditions of the U.K.—deer stalking on those picturesque estates, with all the pomp and circumstance—play a huge part in Rigby’s history, and the Highland Stalker is designed to pay homage to those traditions. The famous bolt-action Rigby rifles that earned that impeccable reputation had a simple yet effective formula: a Mauser barreled action set in a fine walnut stock and given the best English appointments. It’s the 21st century, but little has changed. Rigby and Mauser are reunited, and the Highland Stalker is that classic blend of German metalwork combined with the British flair. 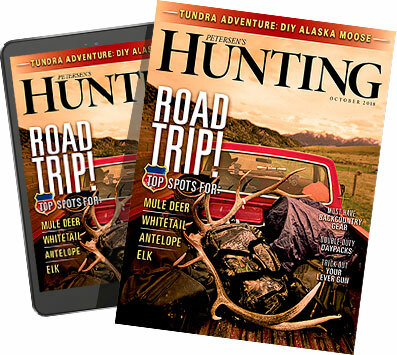 The slim stock profile; the slender, open pistol grip; and the fast-handling design all speak of deer stalking. Compared to our American deer hunting, it’s a different set of traditions, but the common thread is there. This is a special rifle, an heirloom rifle, that firmly grabs the torch and runs with it. 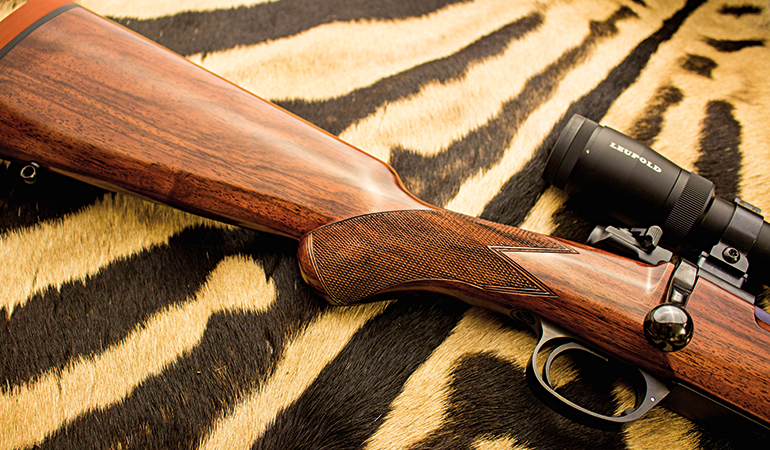 Mechanically, it has a timeless design that is equally at home in any number of hunting scenarios. The ingenious Mauser 98 action is famous for its simplicity and strength and gives positive feeding and extraction. It is still the pinnacle of bolt-action design. The Highland Stalker exhibits many of those attributes, with a modern update or two. Yes, the non-rotating claw extractor and fixed-blade ejector are still present, as are the forward locking lugs, but the modern 98 has a low-profile, three-position wing safety instead of the classic flag safety that doesn’t play well with a riflescope. The left-side bolt release is of the same shape and function as that on the Mausers of a century ago, and working the bolt evokes the feel of a pre-World War I Mauser rifle. That’s where the German influence ends and that British flair begins. Rigby has a knack for giving hunters what they need on a rifle and nothing they don’t. The simplicity is part of the beauty. The stock of the Highland Stalker feels like an old friend, with a pistol grip that functions well in field positions. Quick to the shoulder and steady on target, the Highland Stalker has a stock that I fell for the first time I held it. The hinged floorplate allows easy unloading without the possibility of losing a detachable magazine, and the rear of the stock has a sling stud, to mate up with the barrel-mounted front sling stud. The three-blade rear island sight is regulated for 65, 150, and 250 yards, and the Highland Stalker is drilled and tapped for a scope mounts. The 22-inch barrel has a hooded front sight containing a bold bead that is easy to pick up. English rifles tend to have a longer length of pull than American rifles, and I’m okay with that because I have long arms for my six-foot frame. My test rifle was chambered in .275 Rigby and came with a 14.25-inch length of pull, 0.5 to 0.75 inch longer than our average American guns. While this may sound uncomfortable, I’ve found that many American rifles are actually too short for a proper fit; shooters tend to hunch their shoulders, while a properly stocked rifle from across the pond will actually better fit their frames. Both the test rifle and the .30-06 variant I used in Scotland fit me as though I’d been measured for them. The Highland Stalker’s Grade 5 walnut stock is ambidextrous, having neither cast nor cheekpiece. Hand checkering affords a proper grip while giving a classic look. The rounded, smooth trigger gives a good feel, with no creep and a bit of overtravel; I enjoyed the feel from both the bench and the field positions. The three-position wing-safety is larger than the Model 70-style and gives a very positive click at each position change. All the pretty wood and proper balance in the world don’t mean a thing if you can’t hit what your aiming at. I’m happy to report that the Highland Stalker is a shooter. The .30-06 model I used in Scotland gave a three-shot group of just over an inch at 100 meters, resting on a folded gun slip in drizzling rain. That red stag, however, was unavailable for comment on the rifle’s accuracy at 225 meters. To test that classic .275, I set a Leupold VX-6 2-12x42mm scope in Talley Rings and grabbed some good ammunition, including the Hornady .275 Rigby stuff. You see, the .275 Rigby is simply the 7x57 Mauser under another name and offers the same performance that hunters have enjoyed since the late 19th century. This rifle had me smiling in the first three shots. The Hornady ammo, with the proper .275 Rigby headstamp, shot as well as any factory ammo I’ve ever used and put three shots into a group measuring 0.332 inch. I was also impressed with Norma’s 7x57mm load, using the 156-grain Oryx bullet. Three of those bonded-core beauties landed in a 0.75-inch group. That pair of factory choices will handle game from deer to moose rather neatly. Also, the Highland Stalker had very little recoil—one of the often overlooked features of the .275 Rigby/7x57 Mauser—and that trigger was a dream from the bench. Rigby’s Highland Stalker is not an inexpensive rifle, but it’s one of those pieces that are born with soul. Synthetic-stocked rifles have a place in this world, but there is something wonderful about a handfitted walnut stock and rich, deep bluing. Rigby rifles mellow with age, and each develops its own character over time. I’ve been privileged to shoot some century-old Rigby/Mausers that still have the goods—they’re made to last. This is a rifle that your great-grandchildren will still proudly take afield.